How schools are teaching kids to manage their emotions. Learn More More articles in this campaign. When it comes to social emotional skills, self-regulation—the ability to manage emotions, focus, and handle frustration—is critical. Schools that emphasize school-wide social emotional learning, or SEL engage the entire school community in creating caring, participating, and equitable learning environments that provide social, emotional, and academic growth.When students attend schools that are doing a good job at SEL they report higher academic achievement and better preparation for life compared to students in schools that aren’t teaching SEL skills. Indeed, SEL skills are important, and self-regulation is high among them. But, how well can self-regulation be taught? And, what does it look like when schools do tackle the skill? Here’s how three schools are making self-regulation a part of each school day and how you can, too. The staff at Tumwater High School in Tumwater, WA, started teaching SEL skills three years ago when they noticed 10th grade boys falling behind in their classes. In response, the team created a course that brought at-risk students together for SEL instruction and mentoring. From there, says Lisa Perriera, assistant principal, the SEL focus expanded across the building. It’s been a multiyear process with core values and nonnegotiables established first. Creating one set of values and rules provided the backdrop for students to practice monitoring their behavior. The energy in Tumwater’s hallways and classrooms is calmer with the new nonnegotiables, and the front office is quiet. 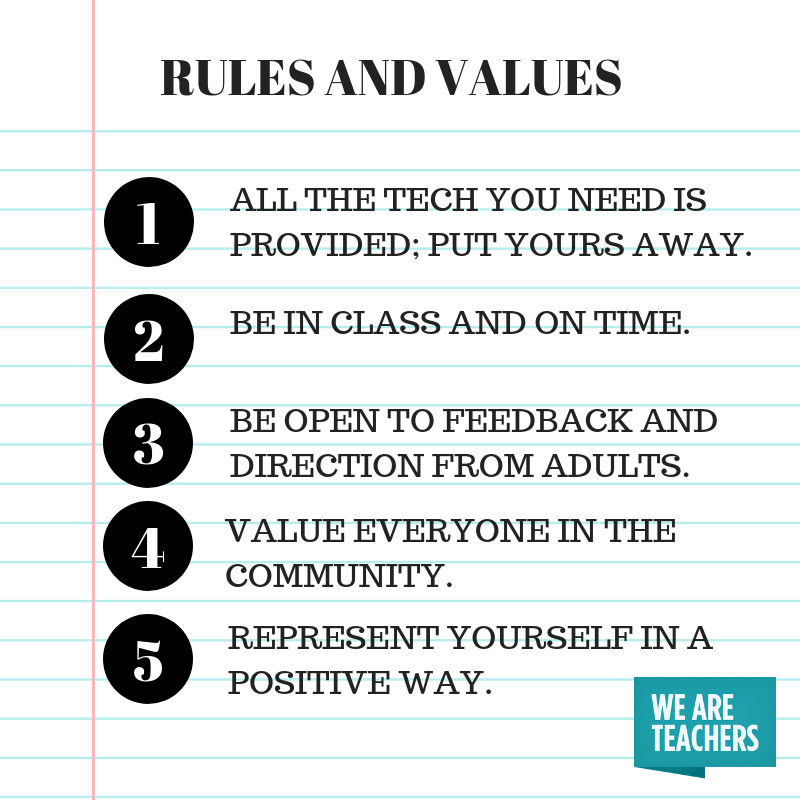 As teachers have reminded students of the first nonnegotiable (We have all the tech you need. ), referrals for inappropriate cell phone behavior have dropped. When everyone knows the expectation, according to Perriera, it makes it easier for the students to regulate their behavior. Now that the rules around technology are firmly in place, the faculty has moved on to reinforce their next nonnegotiable: being in class on time. Each year, Jaime McKeown, teacher at Cumberland Regional High School in Bridgeton, NJ, reviews incoming freshmen data to see who needs an SEL boost the most. Incoming ninth graders, who have struggled with academics, attendance, or managing their schedules, are assigned to a freshman SEL seminar. McKeown’s secret weapon: upperclassmen. Seniors who are models of self-regulation themselves, with organized binders, up-to-date agendas, and straight-A records, in addition to extracurricular participation, lead freshmen seminars as mentors. Instead of complaining that they’re stressed, the counseling staff at Ann Richards School for Young Women Leaders helps students identify the actual emotions they’re feeling. This helps them identify what’s really doing on so they can implement a problem-solving process and move forward. 2. When in doubt, teach. Teach about self-regulation the same way you’d teach about math or science: explicit instruction, modeling, and practice. For example, a lesson defining self-regulation could transition into a fishbowl activity to help students understand a self-regulation skill and how it translates into different contexts. When it comes to self-regulation, practice can make perfect. Create scenarios that students can role-play to practice applying self-regulation habits before they’re in the heat of the moment. The more students practice the better able they’ll be able to self-regulate in the moment. 4. Do a whole class reset. 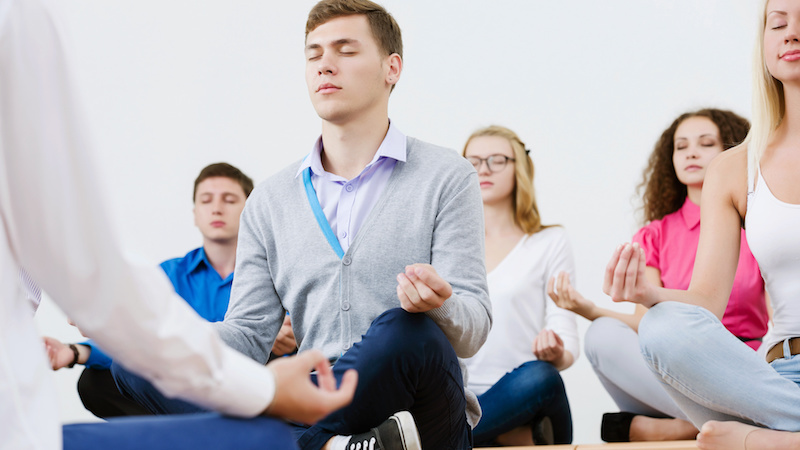 If you feel your group of students veering off course, take a page from the Ann Richards School playbook and have students do a mindfulness activity. For example, have students look around the room (silently) and find five blue items, four red items, three green items, two yellow items, and one black item. Then, once students are more centered, return to the problem at hand. 5. Take time to review student data. Students in the freshman seminar at Cumberland Regional High School monitor their grades closely, which is the first step to managing their own work and progress. Choose a data point that students can monitor (attendance, grades, etc.) and create a procedure to help them track their progress and identify next steps. Explicit skills instruction ensures that we do not rely on student assumptions, but that we purposefully teach students the skills to navigate their world. Social-emotional development can be fostered in a variety of ways to support student success. Explicitly identifying and teaching the skills is important, but It’s of equal importance to do it consistently and often. Knowing the what and why of explicit social-emotional skills instruction can help you make a well-thought-out decision on how to best foster students’ skill development.